My brothers Motorola DCT3416 died, and I figured I would attempt to fix it. I want to start out by saying I know very little about PVR's, other than somewhere buried inside is a standard computer hard drive. While dropping off the DCT3416, my brother informs me that it doesn't turn on, and that it makes this clicking noise. My first assumption is that the HD is corrupt and or damaged and preventing the machine from booting. Replacing the internal HD should produce a simple fix, so lets go about doing just that. 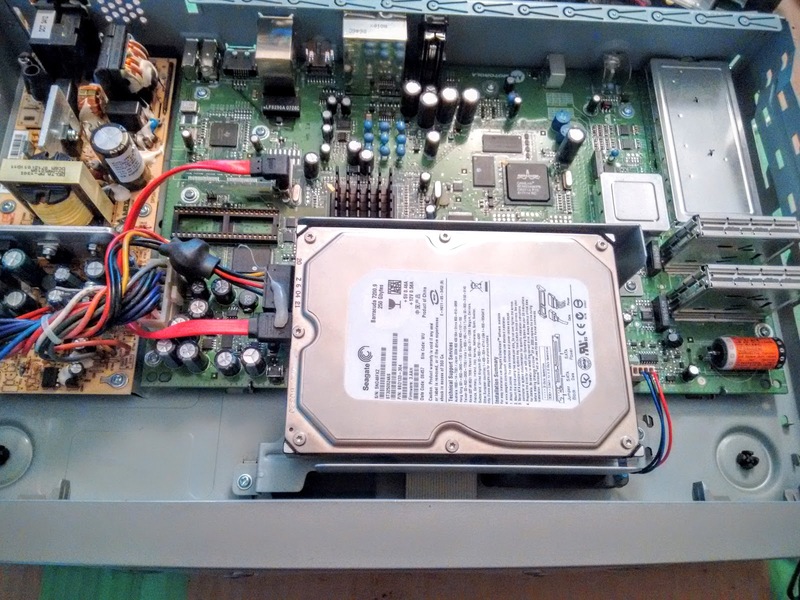 Replacing the internal HD is going to be slightly more complicated than originally anticipated as the rear of the DCT3416 has 3 tamper proof/security screws, which I do not have a tool for. Instead I used a series of pliers, and 10 minutes later had all the screws removed. 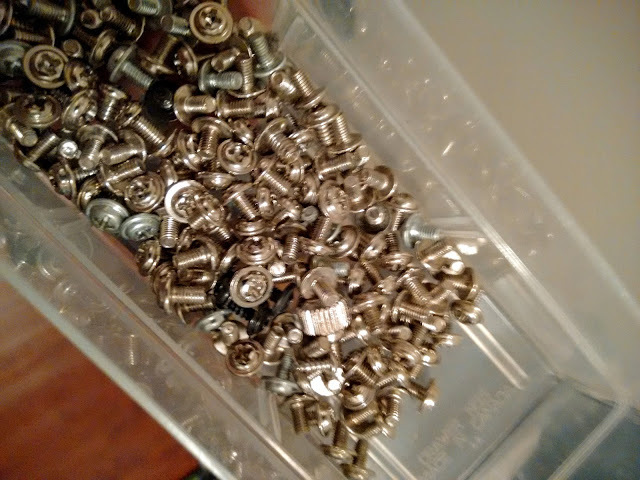 Here is what the tamper proof/security screws look like, once removed. I should add that there is also a plastic security tab, just above the IEEE 1394 jacks, which disintegrated when I attempted to remove it. Looks like the warranty is now officially voided. 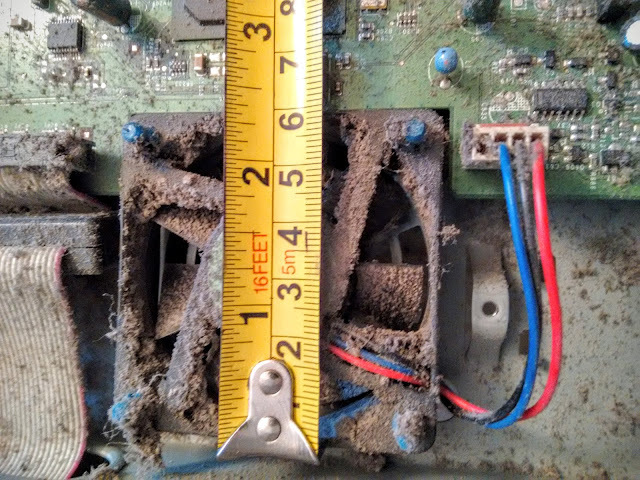 I slide off the cover to reveal the rather filthy inner working of the DCT3416, then I locate the 3.5" internal HD and using a Phillips screw driver I begin removing the four screws holding the HD tray in place. Unhooking the SATA power and data cables from the HD then allows us to completely remove the HD and tray from the DCT3416. I remove the HD from the HD tray by removing the 4 Phillips screws. With the HD removed I take it to my office where I hook it up to a SATA docking station. As I had expected it powers up, and I hear an all too familiar "Click Of Death", reaffirming my suspicions that the HD is indeed dead! 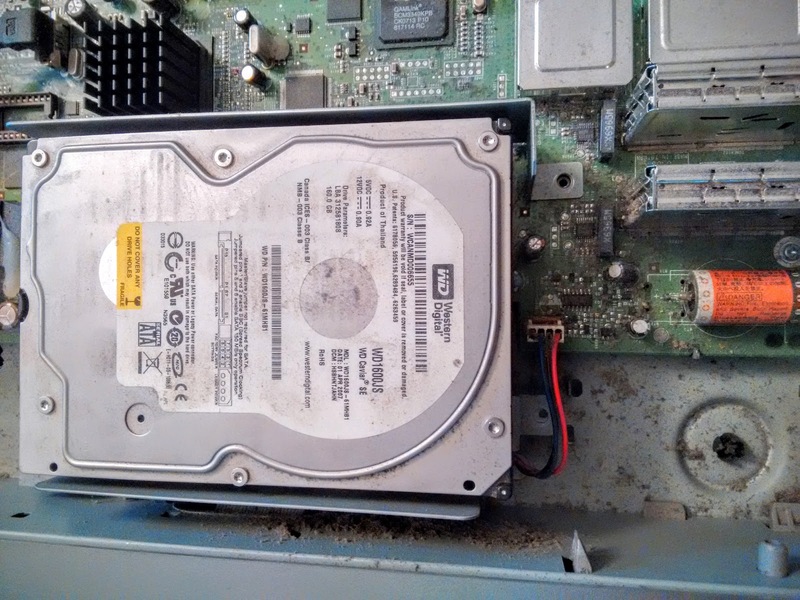 Looks like I need to find a replacement Western Digital 160GB SATA HD, or do I? The HD in Motorolla PVR's never spin down, meaning that if the power is on the HD is constantly working. Motorola PVR's are firmware limited, which means using a larger HD is pointless. The SATA and Ethernet jacks on the rear are not operational. 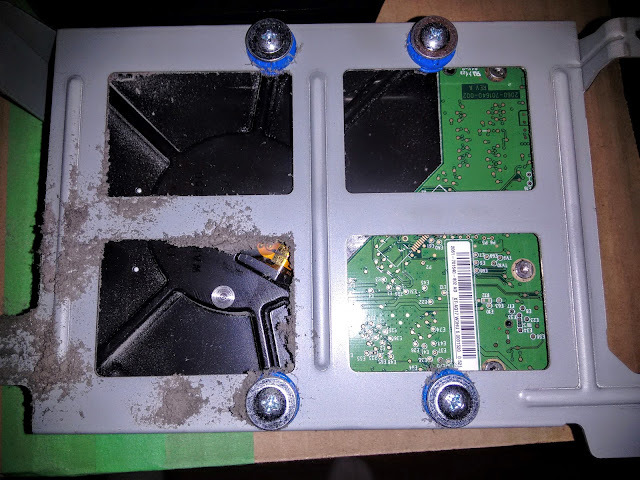 Motorola PVR's have tamper proof screws, which I had just learned. I can use any SATA HD I want. Armed with this knowledge, I decided to use a Seagate 250GB SATA hard drive that I had removed during a previous Server upgrade. My local computer retailer had a 500GB HD selling for $55 + taxes, which would have been a waste seeing as the DCT3416 will only recognize 160GB. It would appear the 250GB HD I planned to install would also be overkill for this project, but since it was just sitting on my desk weighing paper down, it became a great choice.With the 250GB HD in hand I now turn my attention to what I deem as the initial problem with the DCT3416, it's limited cooling. 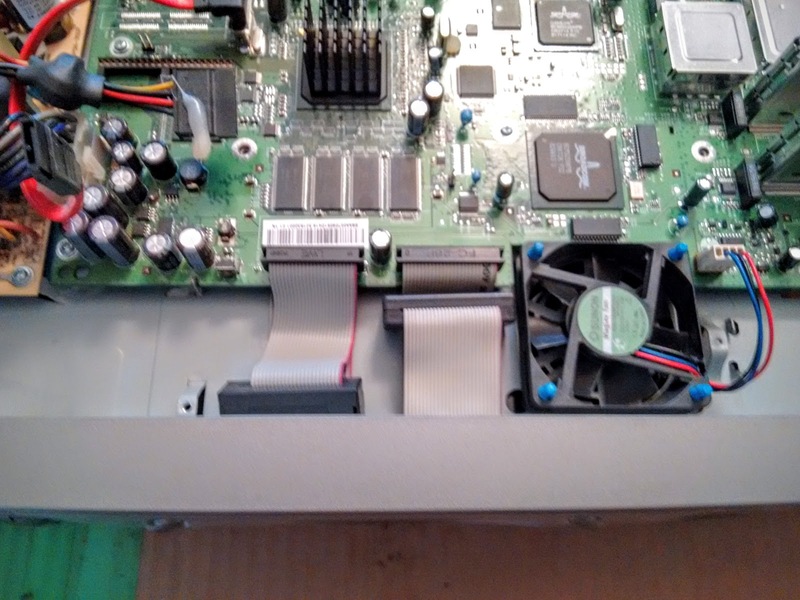 As you can see in the next few pictures, HD cooling in the DCT3416 is done using a 60mm fan located on the bottom of the unit. 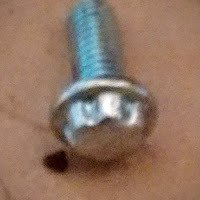 Its unfortunate that Motorola has chosen to use tamper proof/security screws in assembling this unit. As evident in the above picture, a routine cleaning should probably be performed periodically. 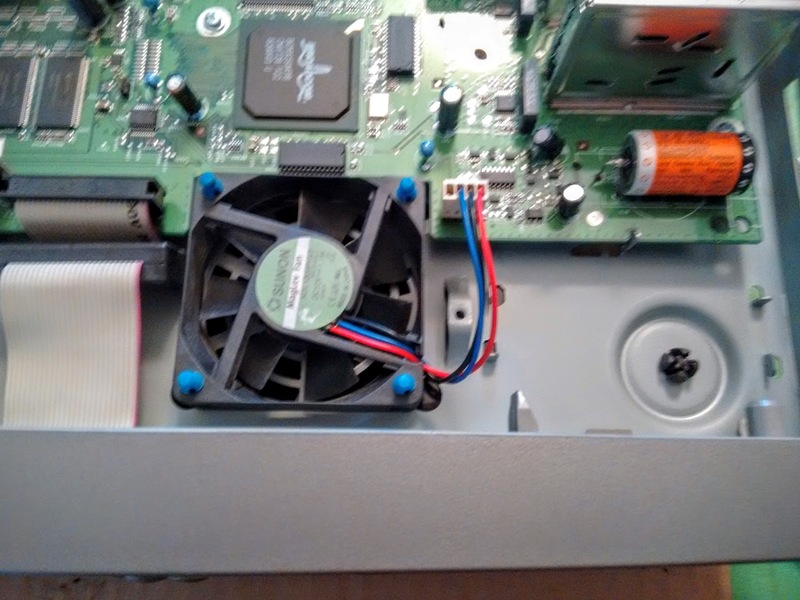 Normally I would urge anyone attempting a HD swap, to also change the fan, as the HD will get very warm, and fans cost so little in comparison. I, however, was unable to quickly locate a 60mm fan, and so I'm going against my better judgement and not replacing it. 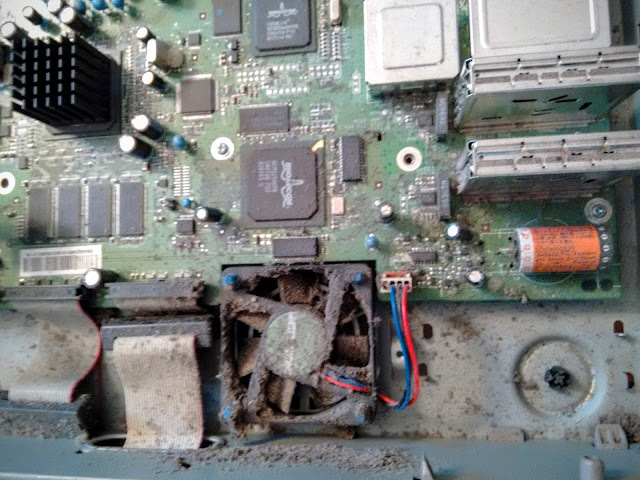 Seeing as I wasn't going to replace the fan, I had to do something to help the existing fan. 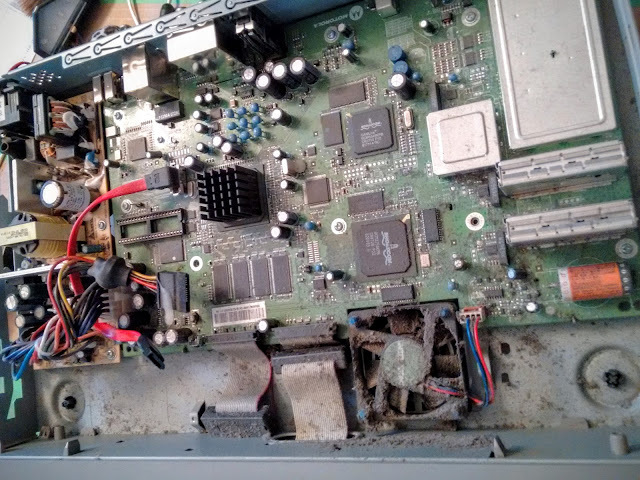 To accomplish this I'll be using the compressor in my garage to blow out all the existing dust and dirt from inside the DCT3416 case. You could probably get away with using compressed air in a can to achieve similar results. Here are the results after a few minutes in the garage. The fan cleaned up nicely and spun quite smoothly, leaving me feeling a bit more optimistic about re-using the old fan. Now on to the reassembly... 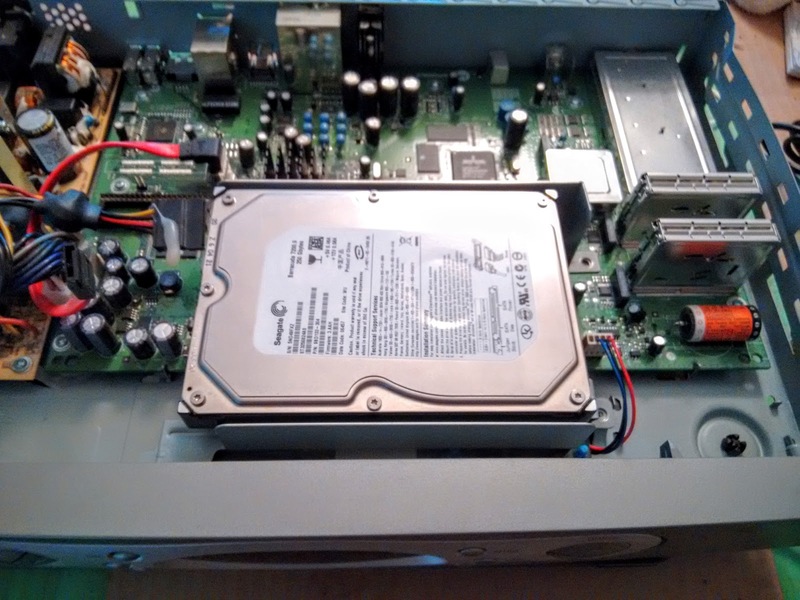 I mount the Seagate 250GB HD onto the DCT3416 HD tray, then reassemble the HD tray back into the DCT3416. I connect the SATA power and data cables. I slide on the cover, and screw it in place using some spare optical drive screws that I had on hand. Since I don't have cable TV service, I couldn't test the PVR portion of the DCT3416. I was however, able to power it up and get it to display on my desk monitor. I'll make the assumption that the unit is working as it should, and leave any further testing for my brother to perform. Hope this post and the information it contained to be helpful and useful for anyone interested in doing a HD swap on the DCT3416. Status update: My brother reports that the PVR is working just fine.